Hot rock massage is a category of therapy massage used to keep your muscles and damaged body tissues relaxed. Most people use hot rock massage to relax their bodies after a stressing activity or a tense time. What happens during a hot rock massage? 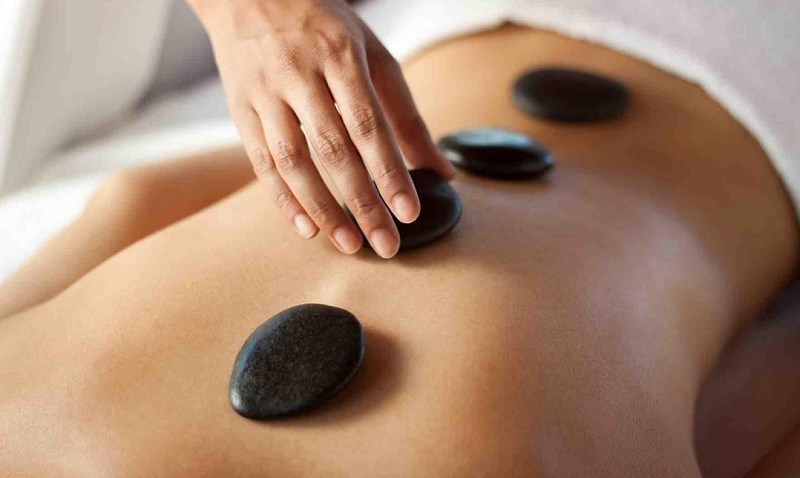 When performing hot rock massage, smooth, flat heated rocks are placed on specific parts of your body. These parts include along the spine, on the stomach, chest, your face, palms, and even feet or the toes. Commonly, these rocks are made of basalt, a rock that retains heat for a long period. The rocks are usually heated to temperatures between 130 and 150 degrees. In another way, the massage therapist may hold these heated rocks as he or she massages your body. This can be done using the Swedish massage technique such as the circular movements, tapping, long strokes, vibrations, and kneading. After using hot rocks, the therapist may also use cold rocks. This is done to calm the engorged vessels if any. It is also used to soothe your skin. The heat from the heated rocks is used to ease muscle tension and pain. This helps to increase blood flow to the affected body parts. The heat also helps to reduce muscle spasms, increasing their flexibility and range of motion. In the case of cold stones, they help to relieve different information. Depending on the symptoms you express, cold and hot rock massage alternation may be very helpful. Massage therapy is considered as an effective way to relieve stress. According to studies, a ten-minute massage will help to reduce cardiovascular responses such as stroke volume. It is also proved that a 15-minute chair massage in a workplace helps reduce stress in a great way, compared to a 15-minute break without massage. According to doctors, patients who received post-operative hot rock massage before undergoing abdominal colorectal surgery experience less pain, tension, and anxiety. For adults with insomnia, massages are a good alternative to sleeping pills. Studies show that back massages promote relaxation and sleep. A study on infants with sleep problems was carried out. It was seen that, after their parents gave them a 15-minute massage, the infants went to sleep faster. Upon waking up, it was realised that they were more alert, active and positive. Though there is no good reason as to why hot rock massages are believed to help you realise a restorative sleep. Doctors have realised that hot rock massage helps to relieve a variety of painful conditions. Such conditions include Fibromyalgia, a condition that results in widespread chronic pains in the body. A study was done on people with fibromyalgia condition. It was noticed that, after receiving ten minutes of hot rock massage, they slept for more hours than before. They also indicated fewer trigger points with decreased levels of the substance involved in the transmission of pain signals. Hot rock massage can also be used to help people with rheumatoid arthritis. Patients who suffered from rheumatoid arthritis were involved in a study. It was realised that patients who received this massage experienced less pain, a wide range of motion after a month and a better grip strength. According to studies, one session of Swedish massage has a positive impact on immunity. Different blood samples were taken before and after the message. It was noticed that there was a decrease in arginine-vasopressin after the message. This hormone is used to regulate blood pressure and water retention. This indicates that hot rock massage can be used to lower the level of AVH when higher than normal. Consider taking hot rock massages for improved health conditions of your body immune system. We pride ourselves on using an exclusive and unique combination of Medispa and wellness under one roof. We are also a peaceful and a luxurious boutique that offers you a specialised beauty and wellness salon services including hot stone and remedial massage. Indica Medi Spa is a luxury boutique spa that is peaceful and offers specialised beauty and wellness salon services. It is time to discover the way we can help you remain healthy and beautiful for many years to come. We also provide IPL hair removal, teeth whitening, metabolic balance and other forms of facials. Our spa proudly use medical grade treatments in combination with results driven skincare. Let our highly trained therapists take your skin to the next level with our range of treatments. Why not give Indica Medi Spa a call 08 8352 5454 today and book your free consultation with us! Come and experience how we can help you live a beautiful and healthy life for many years. "Indica Spa provides a personalised and professional service. In the time that I have been a client the business and premises has entirely transformed -- from the interior architecture to the various beauty, clinical and therapeutic services now available."